The 41-acre River Point Conservation Area is located in the middle of an otherwise highly developed area of Falmouth, Maine. Known historically as Three Rivers Farm, it borders the Presumpscot River and both east and west branches of the Piscataqua Rivers. A network of moderately difficult trails provides hikers with access to birding and wildlife observation. Other activities such as mountain biking, snowshoeing, cross-country skiing, fishing, and nature study are also encouraged in the area. When a trail bridge providing access to River Point was deteriorating, the search began for a replacement. Obtaining the required clearance over the railroad tracks below was a challenge. A design-build team consisting of Baker Design Consultants and Maritime Construction and Engineering worked together to find the best solution. Selected for its ability to meet the clearance requirements as well as for its cost was a 105'-6" x 10' Connector®-style, Continental® truss bridge. In order to provide the required clearance, the weathered steel bridge was cambered excessively. In just one day, the two bridge sections arrived on-site, were spliced together and then lifted into place via crane. "We are very proud of this project, and it was indeed a pleasure to work with everyone involved," stated Lucky D'Ascanio, Director, Parks & Community Programs with the Town of Falmouth, Maine. 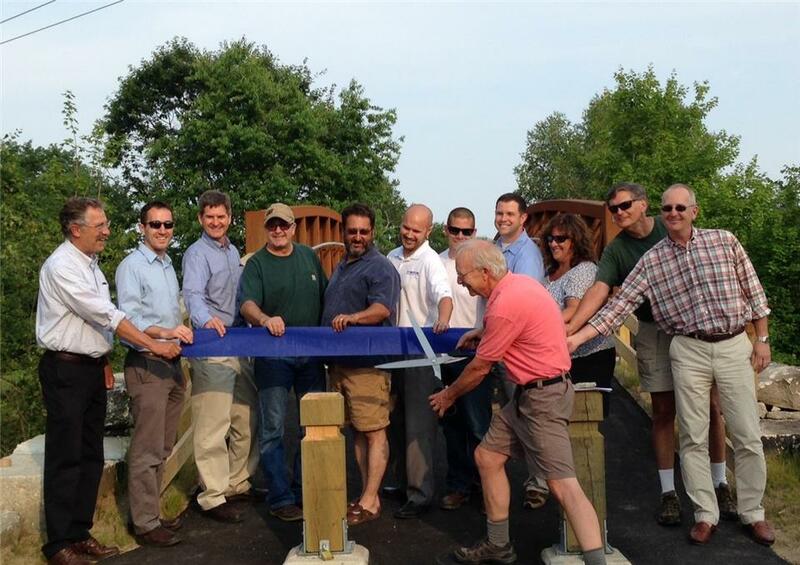 "From start to finish, the River Point Bridge project was a most rewarding experience. The contractors and engineers involved in the design and implementation, along with the volunteers that led the charge to make this happen, have all helped to secure safe public access to one of Falmouth's most extraordinary properties for generations to come." A ribbon cutting ceremony was held in mid-July 2015.